Home » Blog Articles » Alistair Articles » Yemen: Who Is Protecting The War Orphans? 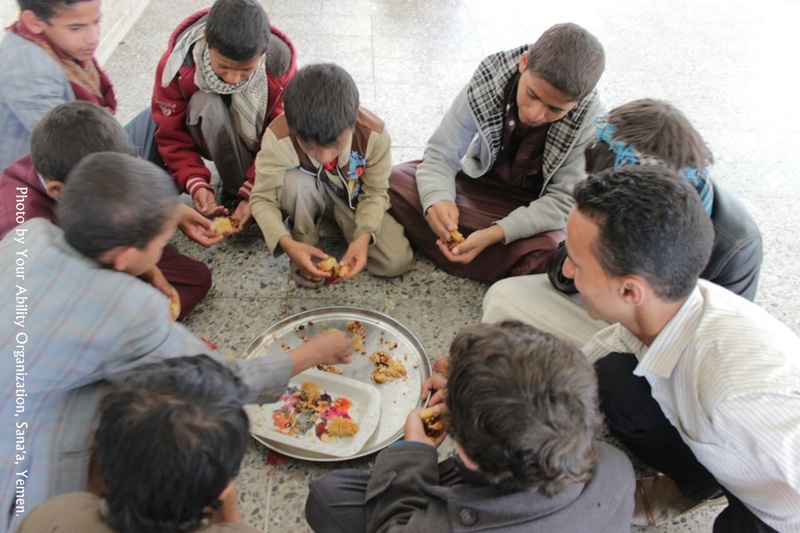 Yemen: Who Is Protecting The War Orphans? By Alistair Reign, April 15, 2016. (Update: 04/16/2016). Alistair Reign News Blog. A question I have been asked many times since I began covering the humanitarian crisis in Yemen; who is taking care of the war orphans in Yemen? It appears the world has forgotten them. I question whether the world has ever acknowledged the Yemeni children’s tragic and worsening crisis. 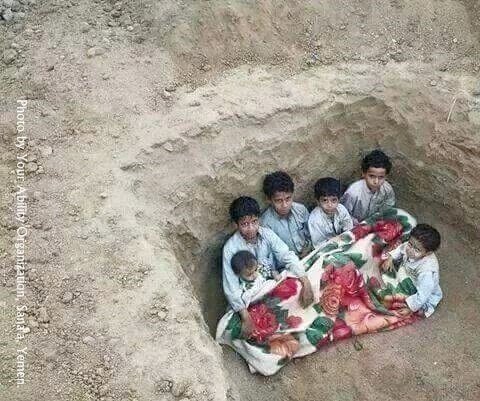 Yemen: (2016) It is now normal for adults to put children to sleep in a large hole in the ground to protect them from sniper bullets and cluster bombs that spray shrapnel, which slice thru their tender flesh. The Saudi’s use of cluster bombs have been responsible for over 10,000 child deaths since 2015. Perhaps because they are not considered refugee orphans – the public on a whole is not paying attention to the gross crimes committed against these little ones – committed at the hands of an invading regime – Saudi Arabia. Humanitarian groups within Yemen are sending out pleas for the intervention of world leaders to help medical staff get the sick and injured children out of Yemen and in to hospitals, or by upholding the rules of war, and use their power as the UNSC to enforce the opening of Yemen’s borders, and allow the rest of the world to save the lives of the children the Saudi King has been ruthlessly slaughtering for the past year. Yemen: Hands of a Yemeni child tell of a harsh life, one that a child that size should never know 2016. We are talking about tens of thousands of children and babies who have committed no crime, they are not a threat to the Saudi regime, yet the Saudi King has reached across his border – seized them in his clutch of terror – and the trauma he has thrust them into is horrifying; seeing parents and siblings killed by violence; surviving only to suffer fear and hopelessness when they realize nobody is there to take care of them; for some orphans there is no family left alive to be aware they even existed. Yemen: A child without protection is a child sentenced to unspeakable abuse or death 2016. A child without an adult’s protection is a child sentenced to unspeakable abuse or death. I have been told that in the best case scenario a family member or neighbor would take orphaned children into their care, but this happens much less frequently, as the past year of constant bombing has been so devastating that adults can no longer extend their protection, not when they are barely able to provide food and shelter for their own children. 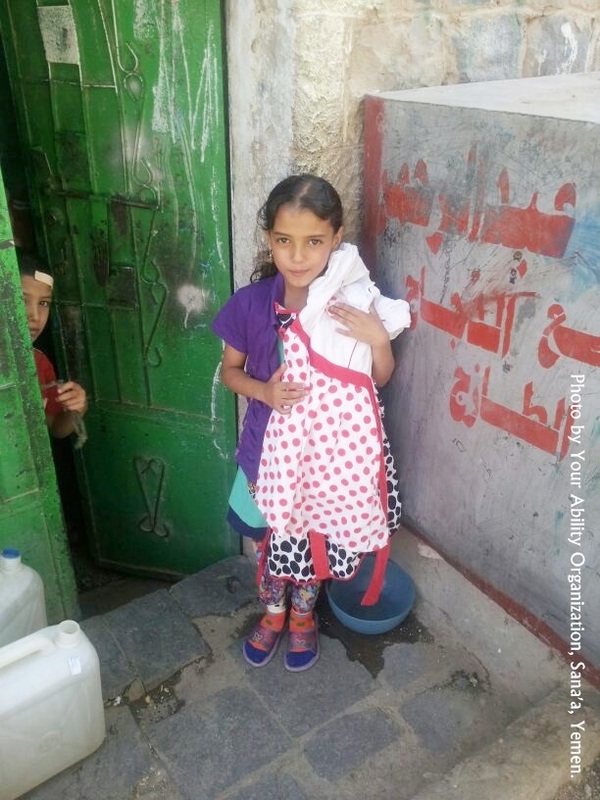 Thankfully there are humanitarians inside Yemen to watch over the little ones at risk. The caring people at ‘Your Ability Organization For Development‘ are defending children against the suffering inflicted on them by this senseless war. “Silence of the world is killing the children in Yemen,” said Mohammed Alharthy. Before: This child was wandering the streets with no shoes 2016. After: Your Ability staff invited him in and fitted him with clothing 2016. I have been speaking with Mohammed Alharthy, CEO and Vice President of Your Ability. and for several weeks he has been graciously walking me through the activities of their organization’s mission, to alleviate the suffering of children, and bring global awareness to the –beyond dire– humanitarian crisis in Yemen, specifically Sana’a where one of their facilities is located. Your Ability Organization began as a development project, receiving permits from social affairs ministry, and has facilitated many courses, such as medical evacuation during a disaster, with the purpose to save people from buildings bombed by warplanes and other weapons, as well how to perform first aid to injured people during a bombing, including how the person providing aid must also save themselves. Yemen: A little girl holding her new dress from YA 2016. However, Your Ability opened their facilities to displaced people last March (2015) with the onslaught of the Saudi-led attack on civilians. Your Ability has been able to provide shelter and warm clothing to the needy people desperately trying to survive the bitter cold in homes with no gas or electricity (if they are even lucky enough to have a house left standing). Your Ability staff has told me that nowadays their focus has been on defending the orphans; and they send out a call for everyone to cooperate in order to stop these violations. Your Ability has plenty of projects aiding the children in all aspects of health, but with the breakdown of an internal structure there is no support for their programs, particularly financial support. Yemen: YAO’s facility, turned into an orphanage, children are safe under the care of a few brave souls 2016. The Your Ability staff and volunteers have created safe havens for the orphaned children by turning their facilities into living quarters. Even so, the hardship of children is great, as is the burden placed on a small number of people, because their own resources are limited by the difficulty of smuggling in medicine and food. 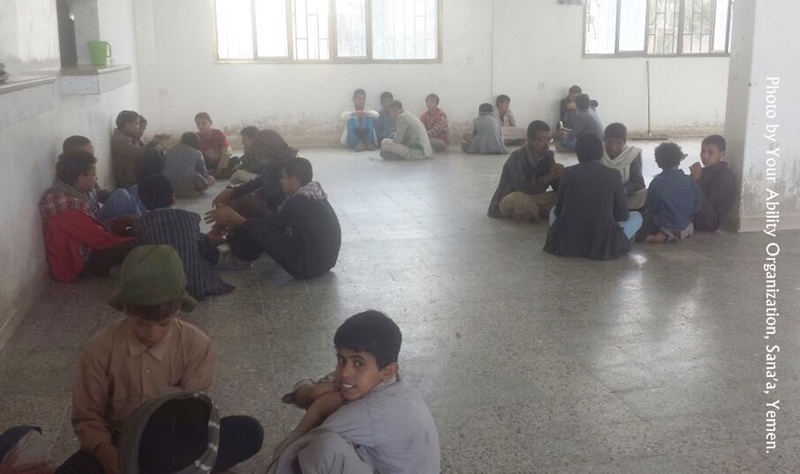 Yemen: Inside YAO’s facility, children are eating dinner with a staff member 2016. The danger these brave caregivers face is also a concern, as Saudi Arabia has proven that they search out the buildings sheltering the disabled and sick, including the elderly and children. When I asked Mr. Alharthy of Your Ability if there was a message he would like to tell the world – his reply was heartbreaking. 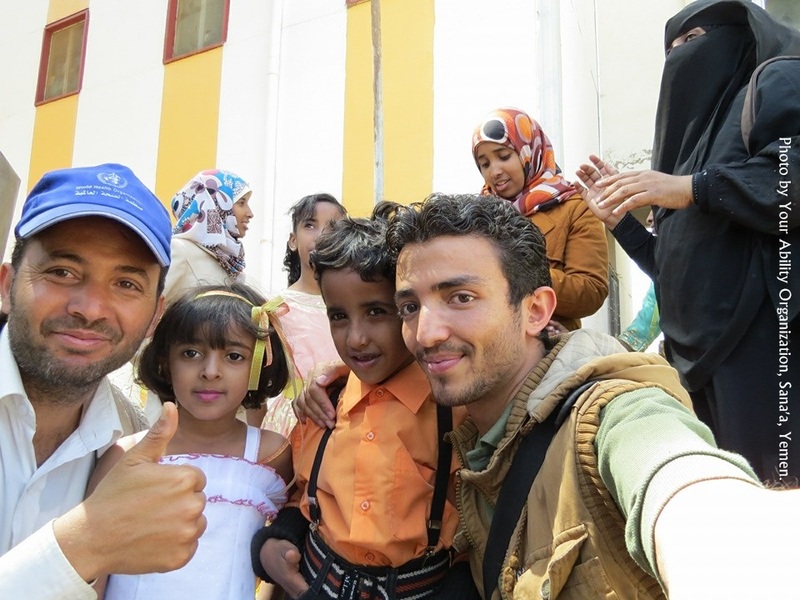 Yemen: Your Ability staff and children take a selfie during their festival for children 2016. The organization explained in more detail the main concern they have identified. A child sent out to search for essential supplies may never return. Yemen: Very young child is carrying a large bottle in his search for water. Your Ability has advised me that the dangers Yemeni children face goes far beyond the cluster bombs and sniper’s indiscriminately targeting civilians of all ages. 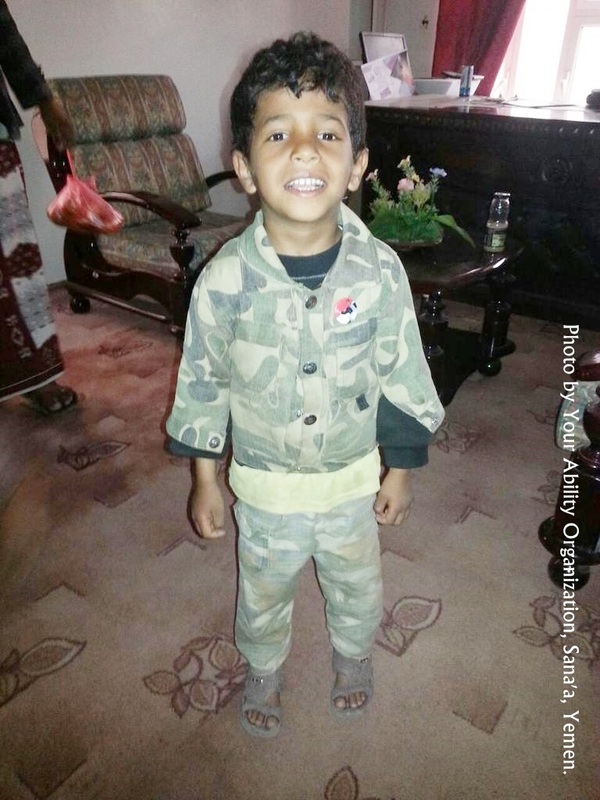 I have been told from several sources in Yemen that a child as young as five-years-old will be sent out alone on an arduous search for gas and water, putting them at risk and vulnerable to many obstacles and crimes against children – including abductions, abuse, exploitation, and even burning of the child’s body. Often that young child is solely responsible for keeping his mother and siblings alive. The Mental Health of a Generation of Yemeni Children. 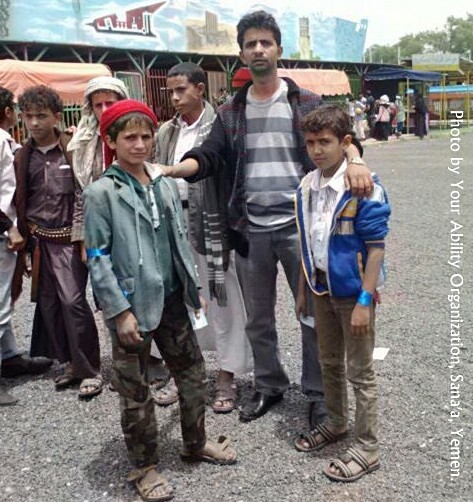 Yemen: Young boys at a local amusement park, seen here with a YAO group leader 2016. During their recent visit to “You are the future” festival for the orphanages, Your Ability provided tickets for children to go have fun at a local amusement park. “In this way we can support them psychologically like all other kids, and give them the chance to develop friendship with other kids by organizing days of recreational, giving caregivers the chance to speak to them about their needs, feelings and dreams, also the troubles they face,” said Mr. Alharthy. Your ability organization also supports the orphanages with food and other essential needs, and together discuss enterprise management for continued support for involving the orphans dynamically in the society. Your Ability Has Teamed Up With Mona Relief to Help Relieve The Suffering Of Children. 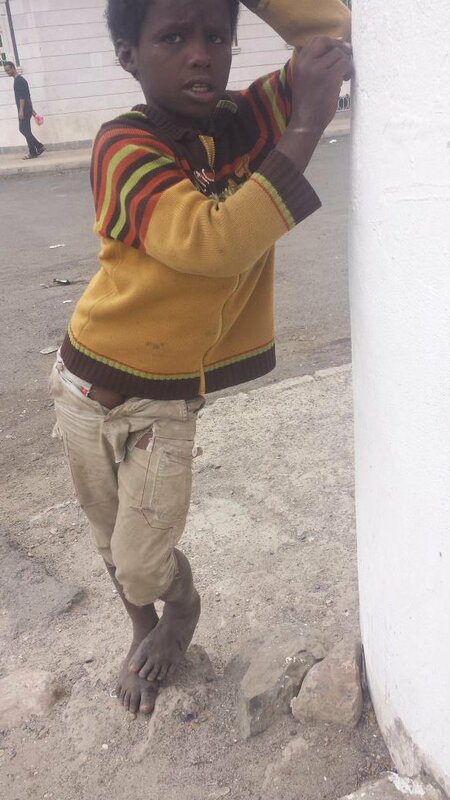 Yemen: This child needs ear surgery after the loud bombs are causing his deafness 2016. Many orphanages have run out of food and medicine as well, and children are dying of starvation and treatable diseases. Mona Relief Charity was able to provide Your Ability with much needed medicine, and together they will deliver them to the orphanages. Your Ability has also joined Mona Relief Charity‘s “School Bags Campaign“, and together they will work toward bringing happiness to the children and stop their suffering. Mr. Alharthy expressed with deep concern that “Many children are waiting for us to return their smile, forty children to date, with their house damaged and with different injuries. “We have done a survey for some places, not all, and had visited many hospital that use to medicate children, and these hospitals can no longer provide all medical support due to shortage of medical tools and the enormity of injuries. Yemen: Young mother receives essential baby supplies from YAO. (I can’t help but notice how skinny she is) 2016. “Many of the children hospitalized have died because of no medicine and no experienced doctors. “The current situation is getting worse, and for that we train many youth to aid people with diseases, and for this, those of us at Your Ability need support. Furthermore, we need an international organizations for doing this project with us in order to cover all provinces in Yemen during this breakout of diseases. 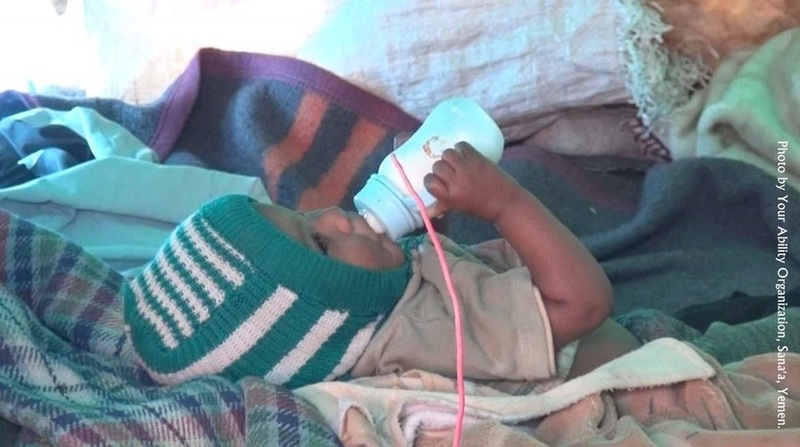 Yemen: A baby is receiving medical care and life-saving milk at a nourishing department in Sana’a. And it is only thru your donations that hospitals can save children from the slow agonizing death by starvation. 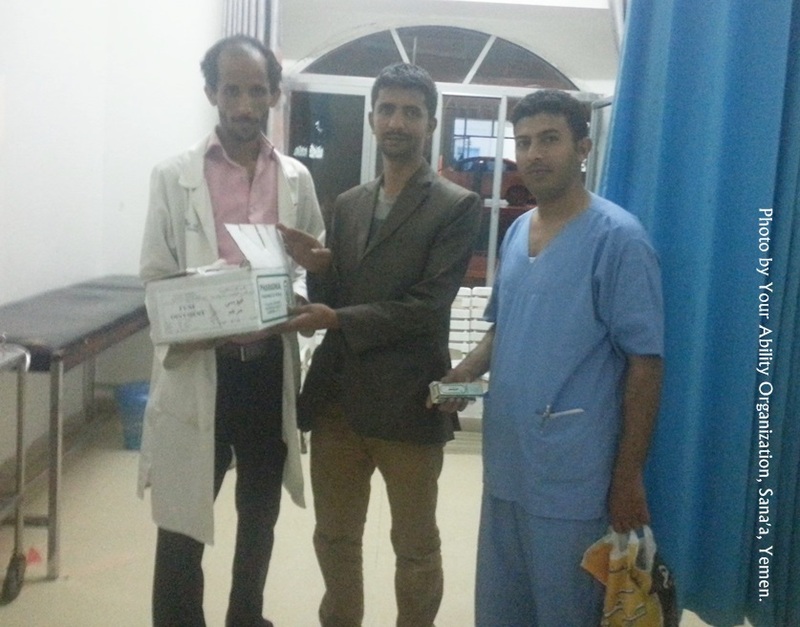 Yemen: YAO delivering warm blankets and medical packages to a Sana’a hospital 2016. “Due to bombing the residential areas, there are many civilian people and children had been buried under rubble. The children have become the victim because his parent were killed, and now he is compelled to carry a weapon instead of pen, for protecting what family he has left. 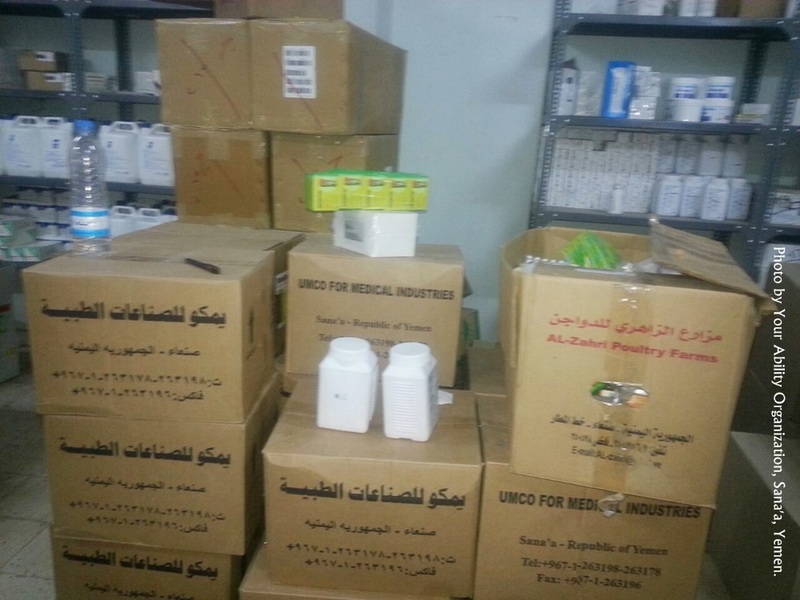 Yemen: Boxes of hospital supplies delivered by Your Ability staff 2016. 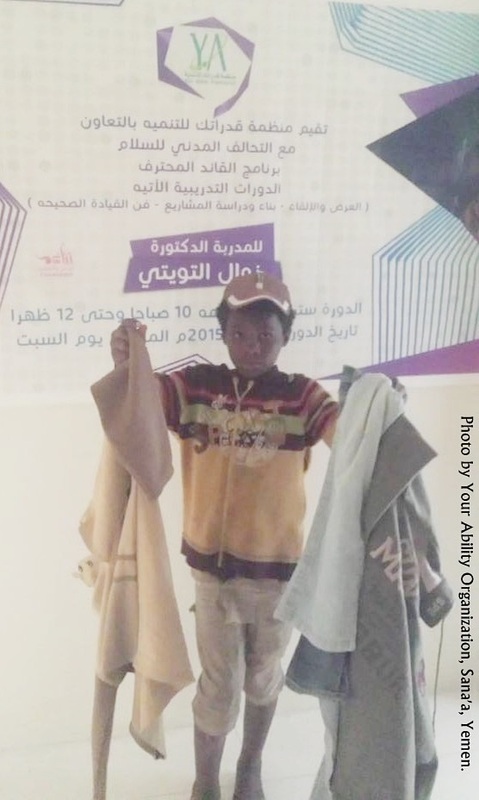 Your Ability Organization has distributed blankets and medical packages to Alsabien hospital’s nourishing department in order to distribute them to aggrieved children, women and men in Sana’a. “There are many cases needing help. Yemen: Youth gather at one of the facilities converted to make-shift orphanages 2016. “We had visited one of the orphanage establishment in Sana’a where one-hundred-fifty (150) orphans between the ages five to eighteen (5-18) years old. This establishment complains from lack of foods as the previous support has all stopped due to the war, and has caused even worse suffering because the children are slowly starving to death. Yemen: YAO visits an orphanage to deliver care packages. These statistics and stories come from only ONE of many orphanages in Sana’a. I would like to acknowledge the staff and volunteers at ‘Your Ability Organization For Development’ for their brave works, and I encourage the world to support the enormous task this small group of humanitarians have taken on to protect Yemen’s future – their children. In today’s world it takes more than a village to raise a child – it takes an entire planet. 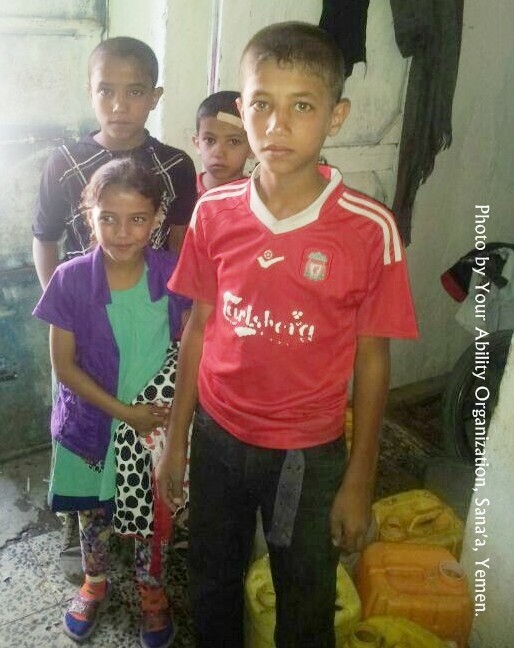 I ask of my readers to give generously to the cause of saving Yemeni children, not only from death, but from a life of misery and mental illness. Now is the time to act – not later. Please donate generously to Your Ability Organization’s Go Fund Me page. One hundred percent (100%) of your donations go directly to the Your Ability and Mona Relief Organization’s bank accounts; in turn, all the funds they receive are used to purchase essential supplies for orphanages, hospitals and poverty-stricken families. There are no intermediary fees taken out of your donation, except for the small percentage the Go Fund Me company shaves off for their fee, and best of all, your money reaches the children very quickly. Their fundraising page is located here: Children Of War Fundraising For Aid. Go Fund Them.